I had been searching and searching for small corn tortillas and just couldn’t find them in our most visited grocery store. I had seen some good looking recipes that called for them and wanted to try them out. Lo and behold, one day I found them! I excitedly threw 6 packages into my cart! I was so thrilled with my discovery that I couldn’t wait to use them. I don’t even remember what the first thing was we tried, but I do remember…those corn tortillas that I’d searched so hard for tasted awful, and were dry as dust! What in the world was I going to do with 5 1/2 packages of them?? 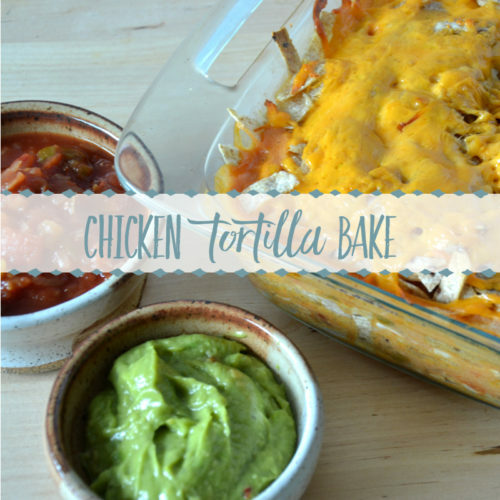 I often find delicious recipes while perusing through my Facebook feed, and was delighted when I found this Chicken Tortilla Bake there. I started doing the happy dance as soon as I read it called for 12 small corn tortillas! 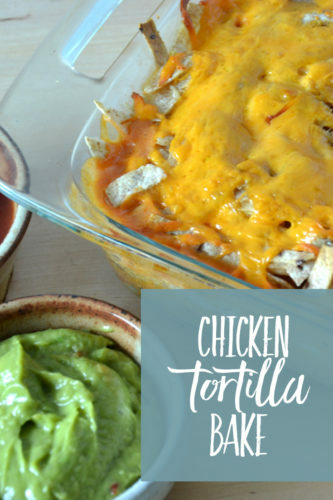 Along with the most important ingredient (tortillas, that is) the recipe called for cream of chicken soup, 1 cup salsa, 3 cups cubed cooked chicken, 1 cup shredded cheddar cheese, and 1/2 cup milk. I don’t have pictures of the step by steps of this, but it is basically a layered casserole similar to lasagnae…and tastes absolutely amazing! We serve it with guacamole, sour cream, and fresh diced tomatoes sometimes ~ or it’s good just alone, too! It has become a 5 star family favorite around here. I’ve long since used up all my corn tortillas, and have discovered that any type of tortilla cut into strips works just great. To get the whole recipe, head on over to Thirty Handmade Days for a printable recipe along with a great little video of how it’s made. PS. Ifyou haven’t joined the Harbour Breeze Facebook page, come on over and join the fun! You’ll find lots more yummy recipe links there, along with home decor, diy, and crafts inspiration.